Subjects, styles, advertising, other relevant information: The 1881 census records William as a single person household in the High Street, Huntingdon, employed as an assistant photographer. No further trace has been found of this photographer. Address: 24 St Andrews Street Cambridge (part of 1885), 47 St Andrews Street Cambridge (1885 - ). 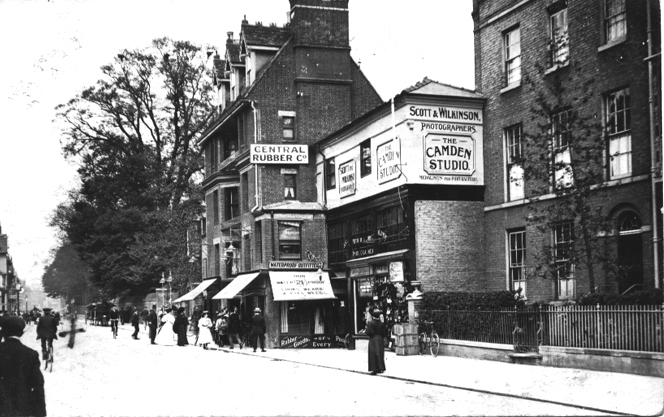 Later this address was named The Camden Studio, Theatre Buildings, Cambridge (c. 1905,) 38 St Barnabas Road, Cambridge (1909- ) Briefly at 59 Regent Street 1932-1933. Subjects, styles, advertising, other relevant information: Photographic firm in central Cambridge for over 50 years. Undertook much University work. Around 200 of the firm's negatives have been deposited with the Cambridgeshire Collection. This link will take you to a Guide to the Scott and Wilkinson negatives in the Cambridgeshire Collection and this link will open an excel spreadsheet listing all the negatives. 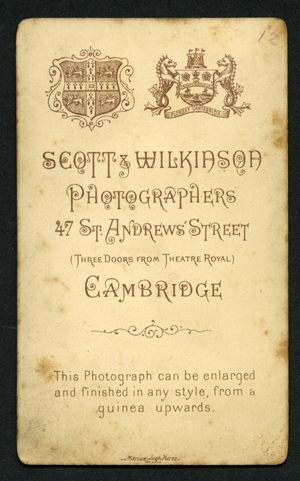 Scott and Wilkinson took over the premises of photographer Henry Faulkner White at 47 St Andrews Street Cambridge in 1884/5, paying £300 for the business. It is not known whether their first directory entry in 1885 incorrectly recorded their first address as 24 St Andrews Street or whether they were at this address briefly before taking over the old White studio. Below is an image from a 1911 postcard showing the firm's premises at 47 St Andrews Street. (Cambridgeshire Collection). The "Scott" side of the partnership was David James Scott b:12/5/1857 Cambridge, d. 1954. In 1891 David James Scott's family were living at 123 Hills Road Cambridge, but David was not listed with them. He was visiting William Cole Norman b:1855 Cambridge, his wife Sarah Ann Norman b:1845 London and aunt Caroline Burgess b:1819 St Pancras at Madeira Road, Ventnor, Isle of Wight. David was described as an artist and sculptor. In 1901 David James Scott was living with his family at 16 Mawson Road Cambridge, his family comprising his wife Bessie Burgess Scott b:1863 Cambridge and sons James W Scott b: 1890 Cambridge and Cyril J Scott b:1898 Cambridge. Scott and Wilkinson exhibited at the annual exhibition of the Photographic Society of Great Britain in 1888, and David James Scott exhibited in 1891 and 1894. Scott was a keen member of the Cambridge and District Photographic Society. He was present at the meeting at Llandaff Chambers, Regent-Street, Cambridge in September 1902 to discuss the advisability of forming a camera club in Cambridge. (Cambridge Daily News 25 Sept 1902 p4). He was a prize winner at the Club's Annual Exhibition in 1905 (Cambridge Independent Press, 3 Nov 1905 p 5). He was elected to the Society's Council in 1906 and served again in 1913, 1915, 1916, 1917, 1919 and 1920. ( Cambridge Independent Press 22 June 1906 p2, Cambridge Independent Press 27 June 1913 p10, minutes Cambridge and District Photographic Society 30 June 1915, 27 June 1916, 26 June 1917, 7 Oct 1919, Cambridge Daily News 6 Oct 1920). In 1911 David James Scott was living with his family at 38 St Barnabus Road, Cambridge. He was described as a photographer and an employer. His family comprised his wife Bessie Burgess Scott b: 1865 Cambridge and sons James William Scott b:1890 Cambridge, photographer's assistant and Cyril Lud Scott b:1898 Cambridge. In the 1939 Register David was listed as a retired photographer living with his wife Bessie at The Alms Houses, Hills Road, Cambridge. The "Wilkinson" part of the partnership was Edgar Wilkinson b:1863 Huddersfield Yorks. In 1881 Edgar was an apprentice photographer in Huddersfield. By 1891 he had been to Cambridge and moved on. He was living at Broughton, Salford, with his wife Caroline Hannah b:1865 Cambridge and son Reginald b:1889 Cambridge. In 1901 he had moved to 31 Trinity Street Norwich where he was described as a photographer and an employer. His family then comprised his wife Caroline, son Reginald, son Stanley b:1894 Manchester and daughter Dorothy b:1898 Norwich. In 1911 the family had moved to Drayton, Norfolk where Edgar was a photographer and an employer. It seems that the Scott and Wilkinson partnership was relatively short lived, but the firm retained the joint names. In 1889 the firm were advertising 15 cartes two positions 6/6d and 15 cabinets two positions 16/6d. In December 1889 the firm advertised extensively that they were severing connections with Mr Gilbert, who appeared to have been canvassing for business on their behalf. 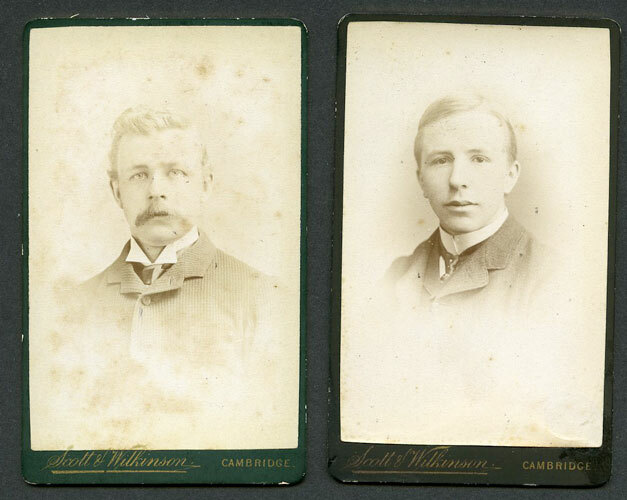 The first carte de visite illustrated below can be dated to around 1884/5 when the firm took over the former studio of bankrupt Henry Faulkner White. The cream mount with rounded corners was produced by Spicer Bros, London. 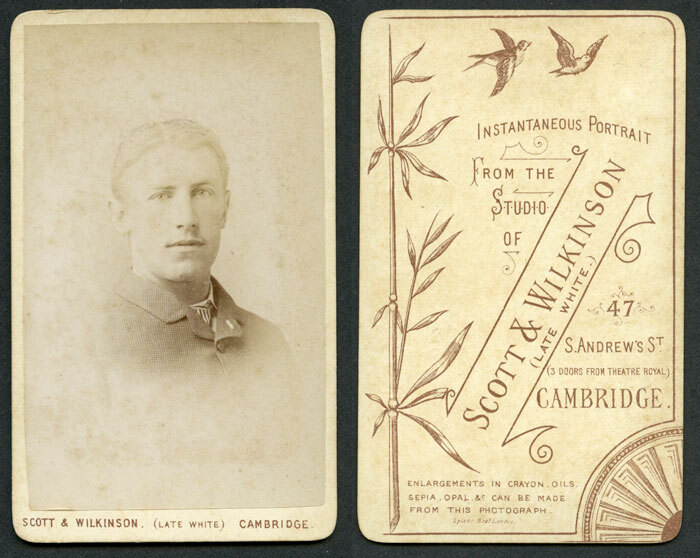 On the face is printed "Scott & Wilkinson (Late White) Cambridge". The reverse states "Instantaneous Portrait from the studio of Scott and Wilkinson (Late White) 47 St Andrews Street (3 doors from Theatre Royal) Cambridge. Enlargements in crayon, oils, sepia, opal &c can be made from this photograph"
The next two cartes de visite below are on mounts by Reeves and Hoare, London, on gloss card mounts, one black, one dark green, bothv with gilt edges. 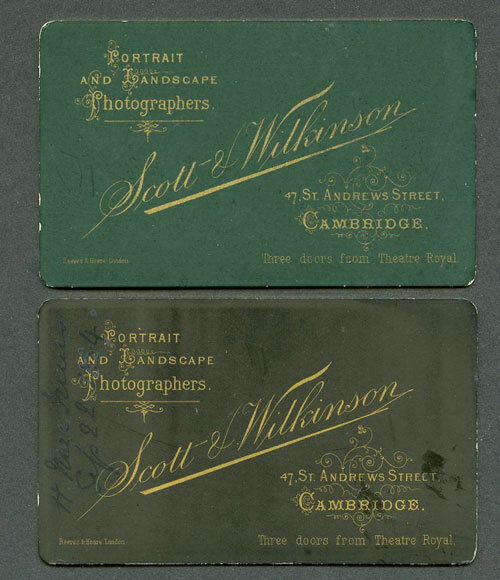 On the reverse both have in gilt lettering "Portrait and Landscape photographers Scott and Wilkinson 47 St Andrews Street Cambriudge Three doors from Theatre Royal". On the reverse of the black mount has been written "H Mac ? ?ees" and the date "22 Sept 1884", making these probably the next earliest Scott and Wilkinson mounts used. 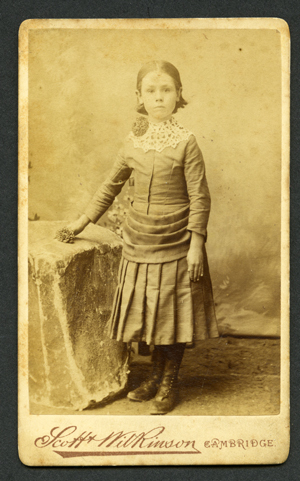 The next image below is from the 1880s (author's collection) is a carte de visite of an unknown young girl with "Scott & Wilkinson Cambridge" on the face. The reverse has a University and a town crest side by side and states "Scott & Wilkinson Photographers 47 St Andrews Street (three doors from Theatre Royal) Cambridge. This photograph can be enlarged and finished in any style from a guinea upwards". The cream mount is by Marion, Paris. 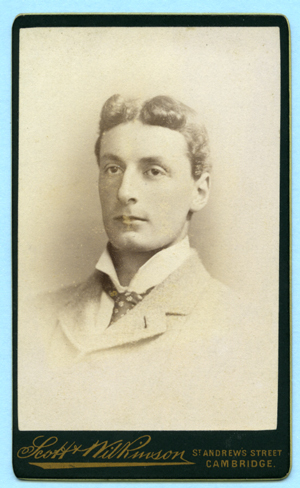 Below this is a carte de visite, from author’s collection, portrait of unknown man vignette style on black mount with gilt edges, gilt writing on face “Scott & Wilkinson St Andrews Street Cambridge” and blank reverse (c. 1900). 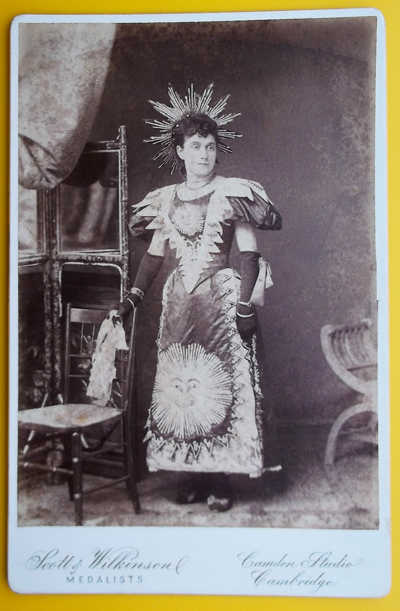 Below this is a cabinet photograph from the Simon Shirley Collection, from a slightly later date judging by the wording of the mount, of an actress in splendid costume with sun designs (the studio was next door to the New Theatre later Theatre Royal). Or this could be a sitter in an elaborate fancy dress, c.1890. 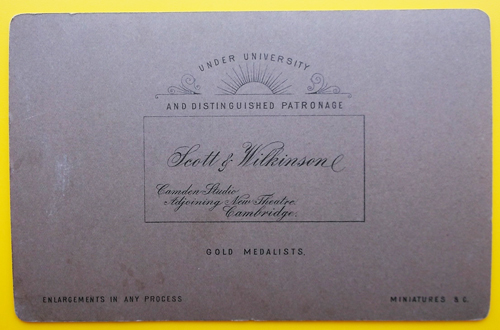 The face of the mount reads "Scott and Wilkinson, Medalists, Camden Studio Cambridge" Below this is shown the reverse of the same photograph on which is printed a radiating sun design and: "Under University and distinguished patronage, Scott and Wilkinson Camden Studio adjoining New Theatre, Cambridge. Gold Medallist. Enlargements in any process. Miniatures etc". The "New Theatre" was built in St Andrews Street in 1896. In 1929 James William Scott took over the management of the Cambridge Daily News photographic and engraving department, as well as undertaking occasional work as a police photographer for the City Police. In 1933 the Camden Studio premises were taken over by the Cambridge Daily News who were expanding with new presses to produce a 24 page newspaper. (Cambridge Daily News 14 Feb 1933, 4 June 1940). In the 1939 Register James William Scott was living with his wife Doris at 21 Haig Road Cambridge and described his occupation as “manager engineering department Cambridge Daily News”. Other photographers known to have worked for Scott and Wilkinson were James Henry Kidd and Harriet Louisa Baker, who later formed their own firm, Kidd and Baker. There were some family connections between the Scott family and the other Cambridge photographic dynasty, the Farrens. David James Scott’s wife Bessie b:1864 was the daughter of William Farren. Another Scott / Farren marriage involved Harriet Emma Scott b:1860 marrying Alfred William Farren b:1866. Subjects, styles, advertising, other relevant information: Son of David James Scott, of the Scott and Wilkinson firm above. Probably worked for Scott and Wilkinson from around 1911-32. Listed as a photographer in his own name in local directories from 1932-1940. The Cambridge Independent Press 28 July 1939 p15 reports that James William Scott, photographer of Haig Road Cambridge proved a number of photos he took for the police of a traffic accident in Hills Road in August 1938. Name: SCOTT, John H. b: c.1840, Beverley Yorkshire. Subjects, styles, advertising, other relevant information: In 1861 John Scott was an engine fitter, lodging in Hull at 69 Stangarth Place. In the 1871 census John H Scott b:1839 Beverley Yorkshire was a photographer lodging at the Kings Head Inn, Thornham, Norfolk. In the 1881 Census John Scott was a photographer, living on the Market Place at March, Cambridgeshire with his wife Margaret b: 1852 Cavendish, Suffolk and son Walter A Scott b: 1874 Cavendish, Suffolk. No trace has been found of John after 1881. References: D.A.Yales Directory of Huntingdon and Peterborough 1967/1968. Peterborough Yellow Pages 1971, 1974. No trace online search facility at Companies House. See also our entry for Leslie Shipsides, who may have been the "Shipsides" part of this firm. According to the BFI site, Scott-Shipsides were the production company in 1970 for a documentary film called "Dow-mac Goes Underground 1" https://www.bfi.org.uk/films-tv-people/4ce2b70e44ca1. Dow-Mac made concrete building components, including railway sleepers. Subjects, styles, advertising, other relevant information: In the 1901 census William was living with his parents in Station Street Chatteris - his occupation was a fitter. 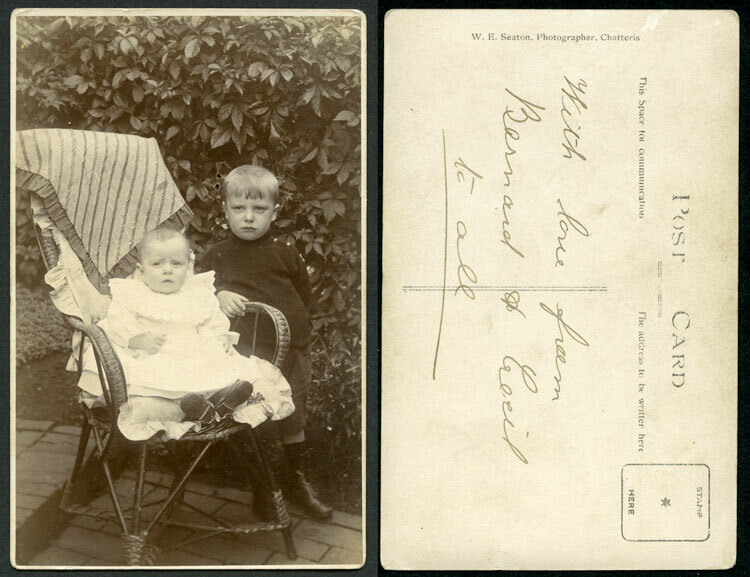 In the 1911 Census William was listed as a photographer working on his own account from home. He was living at Station Street, Chatteris, Cambs, with his wife Blanche Eleanor b:1880 Holloway London and daughter Phyllis May b:1906 Chatteris. William enlisted in the Army Ordnance Corps in 1916 when he gave his occupation as photographer. Below is a real photograph postcard depicting two unknown children, taken outdoors, perhaps in the back garden of the family concerned. On the rear of the postcard is printed "W.E.Seaton, Photographer, Chatteris". Subjects, styles, advertising, other relevant information: In the 1861 census James was listed as a photographic printer. He was living in Little St Mary's Lane Cambridge with his parents, William Sell b: 1813 Kneesworth, a groom and Susan Sell b:1817 Cambridge, brother William b:1840 Cambridge a college servant, and younger sisters Ann b:1844 Cambridge a day house servant, Eliza b:1846 Cambridge and Julia b:1849 Cambridge. There is no information currently to indicate who James worked for. By 1871 James had married and had changed his employment to college servant. He was living at 6 St Edwards Passage, Cambridge with his wife Eliza b: 1844 Grantchester, and her brother Job Piggott b:1846 Grantchester. In 1881 James was still a college servant, living with his family at 25 Little St Mary's Lane Cambridge. Subjects, styles, advertising, other relevant information: Alexander was a travelling journeyman photographer. In 1939 he was in Ely lodging with John Manfield Reed, basket maker. Subjects, styles, advertising, other relevant information: press, PR, commercial, industrial, weddings, portraits, professional E6 processing. Style themselves “The Cambridge Photographers” in 1981 and 1982. In 1983 listed as “The Cambridge Photographers (Bob Seymore), press, PR, commercial, industrial, photo journalism weddings, professional E6 processing”. Also in Yellow pages in 1983 still advertising as “Seymore and Davies” in the 1984 Yellow Pages Bob Seymore’s name only appears. The Cambridge Evening News reported on 26 Jan 1983 that Jon Davis was setting up his own business at 108 Mill Road and that Bob Seymore was continuing the former partnership as "The Cambridge Photographers". In 1985 listed as “Cambridge Photographers 4 Hills Rd”. In 1990 Cambridge Yellow Pages listed at 174 Mill Road named as “Bob and Patricia Seymore”. The Cambridge Evening News 8 October 1990 reported that Bob Seymour (commercial, industrial and press photographer) was closing his Mill Road shop due to economic difficulties and problems of getting skilled stadd. In the Yellow Pages for 1995 Cambridge Photographers were listed at 177 Hills Rd Cambridge. Frank Bird may have relinquished the “Cambridge Photographers” business name in their favour.